O’Malley et al. said, the socioaffective strategy as one of the three learning strategies which include the metacognitive strategy and the cognitive strategy. Socioaffective strategies are the strategies that help learners regulate and control emotions, motivations and attitudes toward learning, as well as help learners learn through contact and interaction with others. Oxford said, “Socio-affective strategies are those which are non academic in nature and involve stimulating learning through establishing a level of empathy between the instructor and students. They include considering factors such as emotions and attitudes” The Socioaffective strategies concern the ways in which learners elect to interact with other learners or their teachers, if possible, they may interact with native speaker. Socio-affective strategies strongly consider the student’s relation to society as a whole ranging from family to the global community. 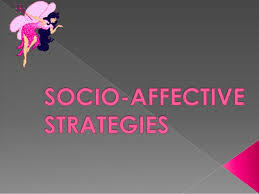 Socioaffective strategies ranked as the most effective strategies in terms of enhancing learning among?????????? ?